After doing all of that I can actually build my project without it spitting the dummy, but when I try to debug it on my device I get the following crash..
@ar2sawseen, no, I was following the instructions @simwhi provided. I can add the plugin in the main activity but how do I add an external class in Android Studio? Also did you view the installation instructions? @ar2sawseen I see, thanks. Yes I did read the instructions. 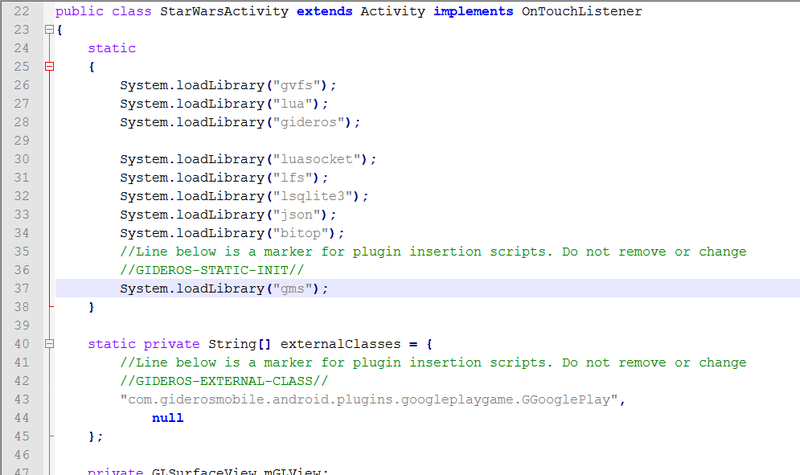 Adding those lines to AndroidManifest generates a new error when debugging. Any idea what is happening now? so I think you need to somehow reference google-play-services in Android Studio. @antix Try changing the the version number for gms-play-services to 8.4.0. That;s the version that is working for me. @antix. I thought I would look into this a bit, but I'm not sure which plugin you trying to get working. I'll try 8.4.0 directly and report back. @antix What is the gaming plugin? Do you know? How strange, now on building I get this error..
@antix, AppStateManager not existing in new google play. You must remove all references for it from GameHelper.java and GGooglePlay.java. Here is the modified GameHelper and GGooglePlay. Just replace it with versions from this zip file. Also here is support v4 library that you must add as depedencies to your project. @simwhi I'm just messing around with my beta and I have some stuff that @test29 has uploaded so I will look at that in a little while. @test29 okay I know how to copy and paste the java files into the correct folders but what the heck am I doing with the support stuff? Nope, no idea how to do this stuff. It should be easy but it's not. 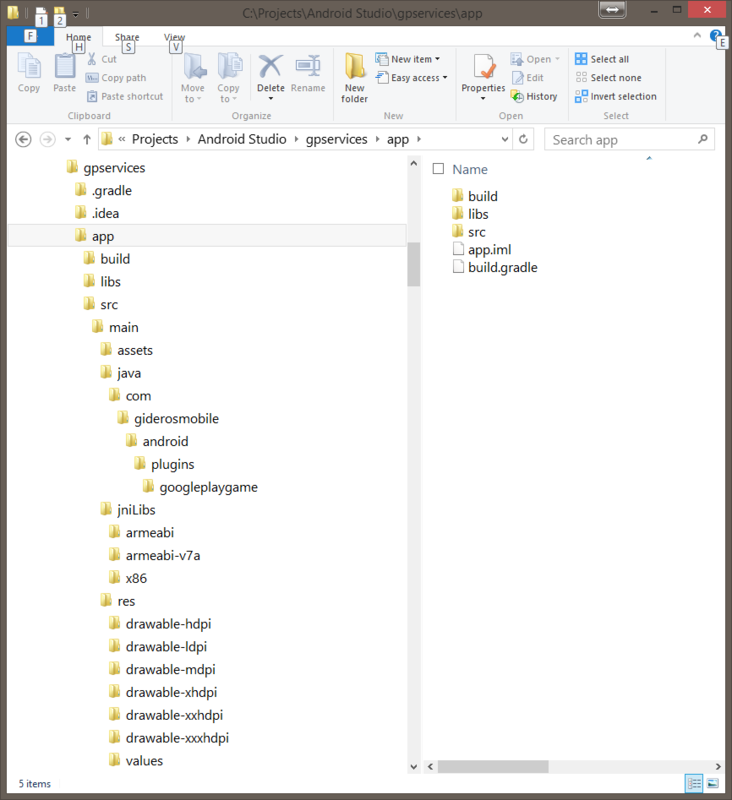 It might be similar to Eclipse but I don't use Eclipse, have no idea how to use it, and have little to no idea how to use Android Studio. Thanks for trying to help though, I appreciate it, even if I'm too stupid to grasp what you are trying to have me do. If you could writeup how to do it in Eclipse I would give it a try. I succumbed and installedit so will try google gaming services tomorrow with it. I would be willing to have a look at Gaming interface, does that do Achievements, Leaderboards, and In App Purchases too? There doesn't seem to be any docs or anything in it's folder though. I finally got the gaming plugin working on android studio. Hope you can make sense of it. A few gotchas that weren't in the docs and largely a case if using an older version of the google play library.